With the release of WordPress 4.9, which includes the Gutenberg Editor and all of the buzz leading up to it, I thought I would feature 2 videos that highlight the editor. Gutenberg is the name of the new content editor you will be using in the version 5.0 of WordPress. After a lot of years using TinyMCE, WordPress will introduce a new editor in its administrator interface that will allow us to create and edit content in a more efficient and simple way. Join Mauricio Gelves in his talk to see the different pros and cons of this big change in the WordPress history. Slides for her presentation can be found HERE. Also, tickets are still available for WordCamp US! Ivica Delic is 45 years old, lives in Croatia and loves technology, especially WordPress. Ivica was searching for WordPress groups on Facebook and decided that he wanted to create a comprehensive list of these groups. This was a way he could ‘give back’ to the WordPress Community. During his research, he became more and more active, eventually becoming an assistant administrator to several groups. He has also created groups such as WordPress Speed Up and Quality WordPress Groups. The later is a place for people to go, not to ask questions, but to find a group that could answer a specific question. You can a list of over 80 WordPress Groups on Facebook HERE. He also created a closed group for Administrators only. Here, they discuss ways to combat spam, trolls and other issues that plague groups on Facebook. Ivica also started a website, Free Lancers Tools which is a resource of various quality tools (some free, others paid) that freelancers may have a need for. There are 6 categories and 15 sub categories. I sincerely apologize for missing the video highlight last week. Sometimes real life interferes with our WordPress interest. This week I am featuring two videos that have to do with the legal aspects of blogging, social media, clients, copyrights, etc. This is something that I doubt a lot of people spend a lot of time thinking about (me!). I learned a lesson recently about live streaming video and all of the ramifications of not having permissions to use certain content. The first video comes from WordCamp Udaipur 2017. Mridul Goswami is a practicing Lawyer with over 3 years of experience and a keen interest in technology. Along with this he has been a web developer for last 5 years. In this talk Mridul shares the importance of setting up correct contracts with clients and essentials for the terms and conditions of a web project. From WordCamp Phoenix 2016 comes this video about other legal aspects. Open Q&A with lawyer/blogger Ruth Carter on the legal dos and don’ts of social media. Topics can include copyright, trademark, FTC compliance, privacy, defamation, employment issues, business formation, and contracts. This is your time to get answers to your burning legal questions about blogging and social media. Florian Gottschall is a professional videographer who fell in love with his trade at an early age. He attended the University of Applied Sciences in Landshut (Bavaria) and has had his own business since 2011. He became involved with WordPress in 2010. Florian and a group of volunteers attended WordCamp Europe and spent their time recording videos of attendees, volunteers, speakers, etc. The videos can be seen on WordPress TV and the WordPress TV YouTube channel. Many thanks to Frank Neumann-Staude for sending the Wapuus below. 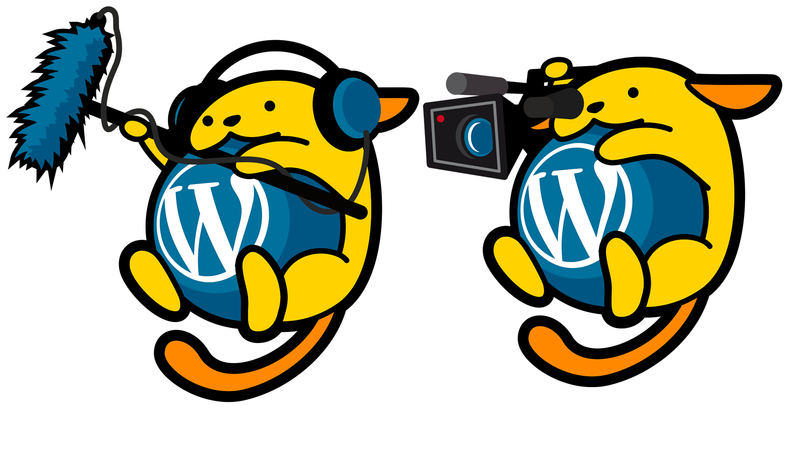 They were created by Martin Purrer at the WordPress Meetup Würzburg. Frank stated that Martin is the one who also made the great Polyglot Wapuus which can be seen at https://make.wordpress.org/polyglots/handbook/about/what-we-do/logos-and-graphics/. Many thanks to Frank, Martin and the people at the WordPress Meetup Würzburg! What kind of views do the videos on WordPress TV receive? After intensive searching, analyzing and examining data for several minutes, here are some results. As expected, any video featuring Matt Mullenweg has a lot of views. The State of the Word 2015 has 12,670 views and the Interview and Q&A – WordCamp Europe 2016 has 6,820 views so far. But, what about the average presentation at a WordCamp? Of course, it depends on the speaker and the subject of the presentation. The average video gets about 200 views on WordPress TV. Overall, the WordPress TV videos are receiving almost 4,000 views per day. I believe this is a testament to the speakers, volunteers and organizers of WordCamps, Meetups and other WordPress related events.